The above was done for my first assignment for the data visualisation course with Coursera. 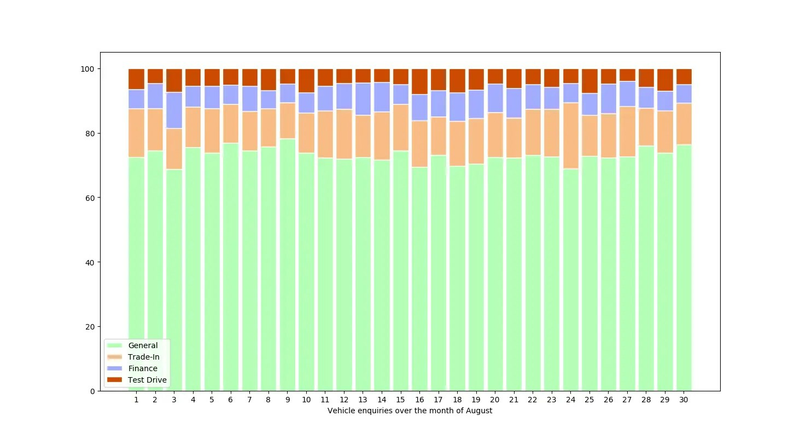 The graph is meant to demonstrate the relative number of vehicle enquiries over the month of August grouped by the enquiry type. The “X” axis on the graph displays each day of the month of August and the “Y” axis is the percentage of the enquiries. I have chosen to use a relative stacked bar as I thought it would be best for the demonstration of the relationship between the different enquiry types. I have used Python and specifically Matplotlib, pandas, and NumPy libraries.